A VERY WELL PRESENTED, GROUND FLOOR, retirement apartment close to local shops and bus stops providing accommodation to comprise: Spacious entrance hall, lounge with French doors leading to outside, kitchen, bedrooms and bathroom. OUTSIDE there are COMMUNAL GARDENS and PARKING. Situated on the popular retirement development of Ruskin Court and close to Doctors' surgery, local shops and bus stops is this very well presented ground floor apartment. The property offers accommodation with all the princple rooms facing south or west to comprise: Communal entrance, entrance hall, sitting room, kitchen, bedroom one, bedroom two and bathroom. Outside there is a patio area and communal gardens and communal parking. Entered from communal entrance hall and with doors to all accommodation, airing cupboard and good size storage cupboard, storage heater. West and south facing, double glazed window, double glazed French doors leading to patio area, telephone point, storage heater. Fitted with a range of wall and base units with work surfaces over, stainless steel single bowl sink with drainer, partly tiled, electric oven with cooker hood over, plumbing and space for a washing machine, west facing double glazed window. 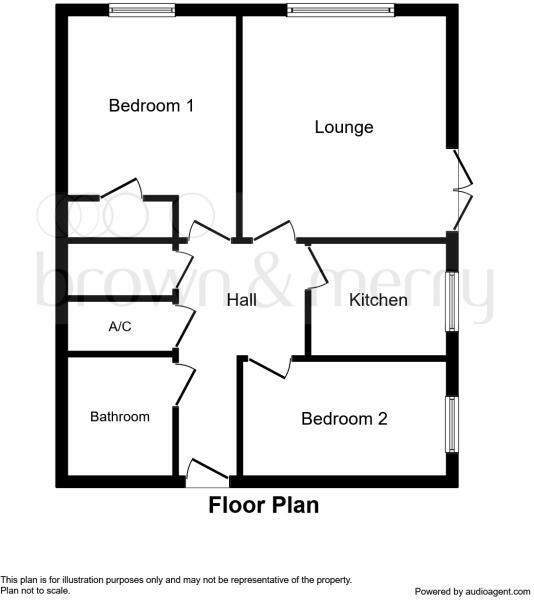 South facing, double glazed window, built-in wardrobes, storage heater. West facing, double glazed window to side, storage heater. Fitted with a suite to comprise: Bath with grab rail, mixer taps and shower attachment over, wash hand basin and w.c., half tiling to walls, extractor fan. There is a small patio area and well maintained communal gardens and parking for both residents and visitors. We have been advised that this property is leasehold but have not inspected a copy of the lease and prospective buyers are advised to check the current position and terms through their own solicitor. RUSKIN COURT IS A PRIVATE LEASEHOLD RETIREMENT SCHEME FOR INDEPENDENT LIVING. PROSPECTIVE BUYERS MUST BE AT LEAST 55 ALTHOUGH A PARTNER MAY BE YOUNGER. Disclaimer - Property reference NPL104299. The information displayed about this property comprises a property advertisement. Rightmove.co.uk makes no warranty as to the accuracy or completeness of the advertisement or any linked or associated information, and Rightmove has no control over the content. This property advertisement does not constitute property particulars. The information is provided and maintained by Brown & Merry, Newport Pagnell. Please contact the selling agent or developer directly to obtain any information which may be available under the terms of The Energy Performance of Buildings (Certificates and Inspections) (England and Wales) Regulations 2007 or the Home Report if in relation to a residential property in Scotland.